It is time to share one of my favorite posts of the year: My annual Christmas in the Community tree on behalf of Christmas Tree Market. 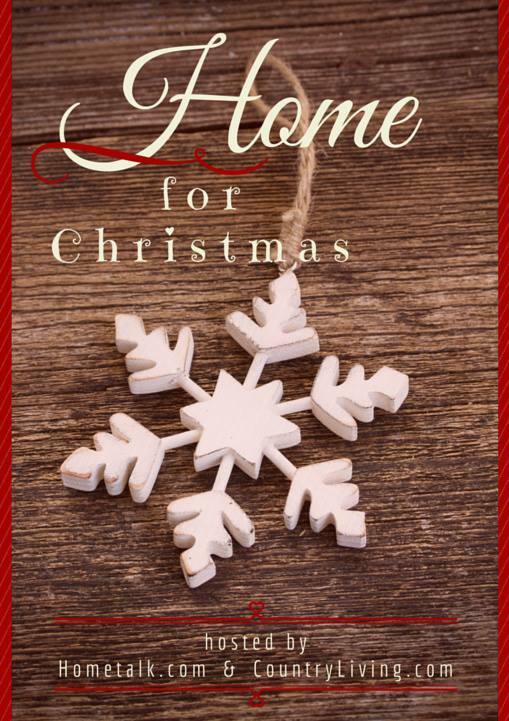 And this year I'm especially thrilled that Hometalk.com and CountryLiving.com are giving me a chance to share it on their Home for Christmas blog hop! Last year, I installed a beautiful tree at COTS shelter for the homeless and it was a wonderful experience. --BACS services decrease emergency psychiatric visits for participants by 90%! Each visit normally costs taxpayers $12,000. --BACS’ housing services have an 85% success rate in finding found permanent housing for participants. --BACS programs allow 95% of enrolled elders to live independently, confident that their basic needs will be met and they are protected from elder abuse! I installed the tree (a super easy to assemble pre-light 7 foot Mountain Ridge Spruce) in the front room of their Wellness Center. This facility has been in use since 1969 and is housed in a gorgeous old victorian home which has been converted to community space, offices and support services. For many of their members this is the only place they will celebrate the holidays, and so having a tree twinkling in the window is so warm and welcoming. But the best part of this tree is the ornaments we used. 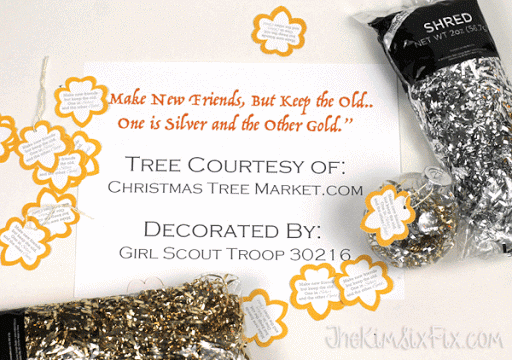 Because last year’s experience was so meaningful, I wanted to involve my daughter’s girl scout troop in this year’s tree. So as our holiday community service project, the girls created the ornaments we used on this tree. Here is a great trick for getting it into the ornaments (since it could get frustrating for the kids): Use a pencil eraser to stuff the filler in. The rubber eraser actually “grips” the shreds and helps push it through. The shreds are really slick and often fingers are too slippery or don’t fit though the opening of ornament! The mixed metallic filler really looks great. Finally, I wanted to create tags (so the girls could personalize them and so you could understand the theme of the tree.) I decided to put the lyrics to Make New Friends on the tags and cut them out in the shape of the traditional girl scout trefoil. I had the girls make multiple ornaments, so they would have one to keep, and others to give away, in the spirit of making new friends. We tied the labels on with embroidery thread. And here is a hint for getting the tags to stay on and lay flat. INSERT THEM UNDER THE CAP. If you runt he loop around one of the prongs, they won’t fall off the ornament. And they made the tree lovely! For filler I added a few other silver and gold ornaments, but our homemade ones stole the show: The entire space is so much more cheerful! And of course, we had to send a HUGE THANKS to Christmas Tree Market. Without them, this wouldn’t be possible. (I was not compensated for this post, but they did provide both the tree and cover the cost of the ornament supplies) The best gifts aren’t always the ones you get.. they are often the ones you give.